Free Blackberry Mobile Phone Unlock Codes and How to guide . and generate your unlock code . If after today you still cant unlock your handset I suggest buying a code from EBay , it shouldnt cost more than one UK pound. YOU WILL NEED 2 PIECES OF INFO . The IMEI of the phone (its unique serial number) and its MEP number (code for your carrier - Vodafone/Swift/EE/Talk Talk/O2 etc etc). 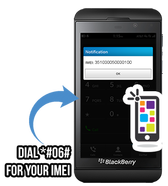 Your IMEI number (dial *#06# on your phone to view the IMEI). Manually directly from your Blackberry Engineering screen. Please download Blackberry Reader from HERE.